Today I download a new iPhone app called Rexly ~ music with friends, by Rexly, Inc. It is an app that brings listening to music into the social networking era, via the iPad, iPod touch and of course the iPhone. As I have an iPad, that is what I used the application on. 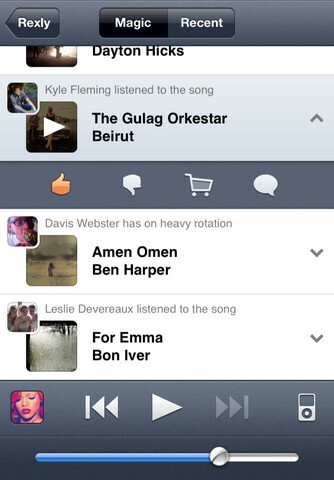 At it’s most basic, Rexly can be used as a music player. It does a good job in this capacity, providing access to your playlists and allowing you basic controls such as forward, backward and pause, and volume control. It also lets you shuffle within playlists, which can be nice to change things up. However, the title of this review is Social Music, so let’s get past the basics and into the real meat of this application. The Rexly app allows you to share what you are listening to with not only your Facebook and Twitter friends, but also the Rexly community as a whole. You can follow other users who share you music preferences, or just follow friends on either social networking site. You can see what is popular at the moment in what appears to be a timeline presentation. The one thing you can’t seem to do is access your entire music library at once, which can be limiting if you use album playlists like I do. This isn’t a huge deal, but being able to shuffle everything without making a specific playlist would be nice. Definitely not a deal breaker, because it has a lot to offer if you’re like me and love to share your music with the world, or in my case, Facebook. This brings me to one other thing I would like to see in future releases, more ways to publish. While the current choices are okay, more is sometimes better. Again, not a deal breaker, but more options might be nice. By clicking on the popular section, you can preview what other people are listening to, and there is even an option to buy the song if you like it. Overall, I really like the concept of Rexly, because it gives you a way to share the music you love with friends and other people who appreciate music. However, as it stands now, the program will really benefit you most of you know a lot of people who are already using it, or happen to find people in the popular stream that share the same music tastes as you. While that works, perhaps if there was a way for Rexly to match up what you listen to with other users, it might open up a whole new way to share music. On the whole, I would definitely suggest giving this a try, it could very well influence the way you listen to and share music in the future. AppSafari review of Rexly ~ music with friends was written by Darius Reimm on October 2nd, 2011 and categorized under App Store, Music, Social. Page viewed 5190 times, 1 so far today. Need help on using these apps? Please read the Help Page. One quick note–if you press the play button at the botton center of the home screen, the app will shuffle your entire library. We’ll make this more obvious/accessible from other views in later releases. And there are many, many more features on the way (incorporating more music services, more sharing platforms, better friend/influencer discovery). This is just the beginning.